After over 40 years in Delano, Al’s Old and New Book Store moved in 2014 to 360 E William Ste. 102 in Downtown Wichita. Our location is on the ground level of the Block 1 parking garage, facing out onto William Street with diagonal parking right in front. The store is open Tuesday through Saturday 10 am to 5:30 pm and closed Sunday & Monday. We will be having a book signing and Acoustic performance by Robert Hunter, Nashville Singer, Songwriter and Author on April 3, 2019 3-5 pm﻿! For more details see the News Page. Our phone number is still 316-264-8763. 360 E William is downtown, one block south of Douglas, between Broadway and Topeka on the north side of the street. The store's building is behind the Kansas Leadership Center and Health Foundation building and is in the same block as the Ambassador Hotel.﻿ There is metered, angled parking out front, free parallel parking on Topeka right beside our building, and the parking garage (not free) overhead. We still miss Delano, but are pleased to have a nice new space with easy access to highways, parking and the city bus system. Remember that the parking meters in front of our store do not have to be "fed" on Saturdays, Holidays or after 5 pm during the weekdays. Al's Old & New Books is in it's 61st year of selling books in Wichita. We stock used, out-of-print and rare books in both hardcover and paperback. We also stock new local authors and local history books, Special search services are available for hard to find titles. Al’s does not try to carry current, just released, titles because you can get those at most discount stores at prices that are as low as our cost. 40,000 books are available in 2,000 sq ft. Local History, American, Presidential and War History as well as World History, Ancient and Modern. Aviation, Engineering, Sciences, Art, Religion, Cooking, Pets and many more non-fiction subjects. Also, Classics, Mystery, Cozies, Science Fiction/Fantasy, General Fiction, Westerns, Romance, etc. We also have a Children's and Young Adult area. Come in and see us! We have about 40,000 new and used hardcover and paperback books. If we don’t have it, it's likely that we can get it for you. Check out our news section for recent and upcoming events at our store and in the Delano area. Our policies page has information on how we handle things like trade and ordering books. ﻿New copies of Arcdia and History Press titles are always discounted 10% at Al's. and many other Kansas titles! 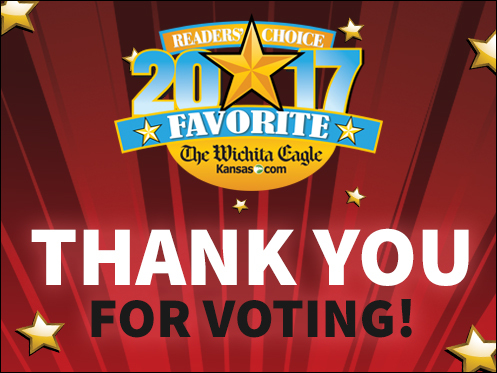 Al's Old & New Books was voted a Favorite Local Bookstore in the Wichita Eagle's Best of Wichita contest 2017.